Movie Review - 'The Illusionist' - For A Magician, A Curtain Slowly Falls From 1959's Paris, a struggling magician travels to Edinburgh and meets a girl who believes in him. With beautiful imagery, the film is a mostly melancholy -- but not entirely hopeless -- story of a fading era. First appearing in 1953's M. Hulot’s Holiday, and then in later classics like Mon Oncle, Playtime and Traffic, the character of Monsieur Hulot was Jacques Tati's throwback to the silent-comedy icons of yesteryear -- clumsy and put-upon, with an ungainly frame that aggravated his mishaps. Like the onscreen personas of Charlie Chaplin and Buster Keaton, Hulot is something of a loner, but Tati brought that sense of isolation and melancholy more explicitly to the fore. It wasn't just that Hulot had trouble fitting into modern society, but that he rejected it altogether; the humor and underlying sadness of Tati's films tend to arise from his haplessness in the face of change. 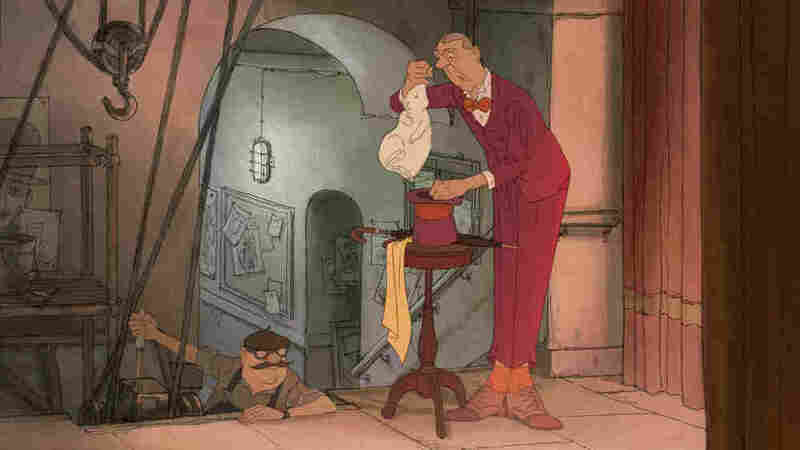 Adapted from an old Tati script, Sylvain Chomet's wistful animated film The Illusionist works carefully -- too carefully, in the end -- to bottle Hulot's spirit like a bittersweet elixir. Some of its nostalgia and all of its beautiful, hand-crafted images will be familiar to fans of Chomet's first feature, the eccentric Jazz Era homage The Triplets of Belleville, but in most other respects it's a striking departure. Where Belleville feverishly evoked '30s Betty Boop and Popeye cartoons, along with showstoppers like Django Reinhardt and Josephine Baker, The Illusionist mourns for an entertainer's gradual passing into obscurity and obsolescence. Its delicate humor is vastly eclipsed by a bone-deep sadness. The Illusionist opens in Paris 1959, where its hero, an aging magician named Tatischeff (Tati's full surname), plays to near-empty theaters like a pro, forging ahead with musty old sleight-of-hand tricks and a rabbit thoroughly fed up with being pulled out of a hat. Tatischeff accepts his walking papers with a gentle, expectant nod, rolls up his sole promotional poster and prepares to take his act on the road. After a brief stint in London, where he's upstaged by a floppy-haired rock outfit (Liverpudlians, perhaps? ), Tatischeff finds a more permanent home in the craggy outpost of Edinburgh, Scotland, and it's there he meets Alice, a young chambermaid who believes he can really do magic. In Edinburgh, Tatischeff meets a young chambermaid named Alice and struggles to sustain her admiring belief that his magic is real. 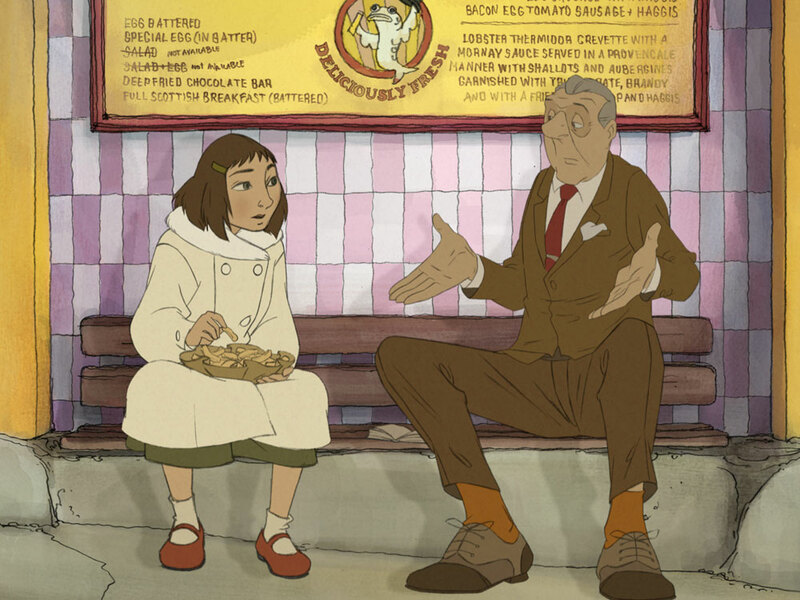 Though lovely to the core, The Illusionist misses some of the exuberance that enlivened The Triplets of Belleville, particularly during its comic set-pieces. A sequence where Tatischeff moonlights as a car mechanic, despite knowing nothing about tools and machines, presents an opportunity for Hulot's patented physical shtick, but Chomet stages it at an agonizing pace. It's the rare occasion when animated comedy could be criticized for failing to keep up with live action. At the same time, it's possible Chomet was willing to sacrifice comedy in order to serve the pervasive mood of The Illusionist, which is about the curtain slowly drawing down on an entertainer's life. There's not much dignity in retiring to tepid applause and severance checks, and the film aches as Tatischeff and his fellow travelers (acrobats, a ventriloquist and a clown) are eclipsed by the theatrical fads of the day. Yet as sad as it gets, The Illusionist could never be called despairing, because it really does believe in magic -- not the kind that materializes out of thin air, but in those small, crucial moments of generosity and connection that enrich our lives.